In 1951, Upendranath Ashk wrote a passionate defence of his six-volume series of novels, Girti Divarein, their protagonist a lower-middle-class Punjabi man in the 1930s. “The question is, in this age of struggle, for whom does the storyteller write?” he asked his critics. He wrote, he said, not for Kalidas’s maharajas, but “for the thousands of other mud-smeared souls”, like himself, setting down “the tiny, aggravating details of life that leave a bitter taste in one’s mouth”. 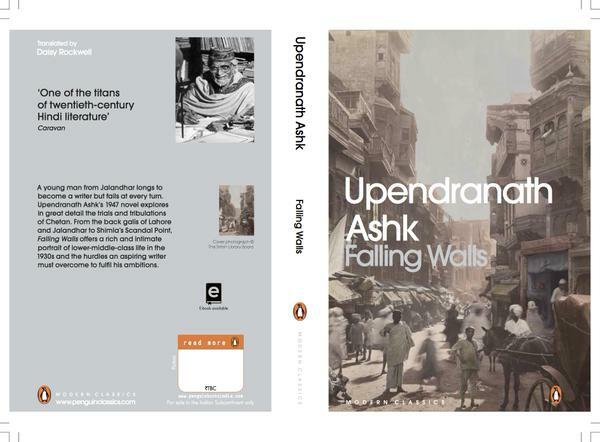 I had read a lot of Ashk growing up in Delhi, but ducked the Falling Walls novels in the same way you put off reading Proust, or all of Tagore, or other classics: marking it down as monumental, intending to get around to it some day, and permanently postponing the encounter in favour of other, more contemporary books. This first volume (Falling Walls, Penguin Books, Rs 499, 486 pages), spans Chetan’s life in Jalandhar, a student at an indifferent college who wants to go to Lahore to experience life; his years in Lahore as an aspiring and permanently failing author; and an episode in Shimla, where his gratitude to the benefactor who takes him to the hill station changes when he realises he has been pressed into service as an underpaid ghostwriter. His father and mother, Pandit Shadiram and Lajwati, live in a shabby ruin. The gallis and sewers of Lahore and Jalandhar, unlovely newspaper offices, mud-caked drains, the memory of beatings from his father in childhood: these form his world. Chetan veers between trying to write poems and short stories, distracted by a growing interest in women, and the usual necessary and demanding relationship between him and poverty. His marriage is arranged to a plain girl called Chanda, while he dreams of other women whom he meets only in glimpses – Kunti, Neela – relationships built on fragments, dreams, stray moments and accidental damage. And yet he never lets go of the dream of being a writer. In Lahore, his mischievous nephew crushes his thick (and mostly unpublished) file of essays, stories and poems. The notebook in which he has kept the outline of his great realist novel slips from his hand into an open sewer. When he decides to publish his stories himself, he has to ask a new friend, Kaviraj Ramdas (an expert in curing sexual ailments, known as a patron of writers) whether he might arrange for the paper to print his book. In contrast, all that Chetan has to his credit is the power of his imagination. “The foul atmosphere of Changar Mohalla, the stifling claustrophobic environment of the newspaper: when these came into contact with the touchstone of his imagination they became excellent, lovely and radiant.” And so he lurches from failure to failure, and all of his failures are more beguiling, in Ashk’s hands, than any success story could be. Wonderful, Nilanjana! You have given your readers a bonus. In addition to the new column Printer’s Devil we are now treated to your reviews of translated work. I have a request – will you do a review of the Malayalam novel Aarachar which is now available in a great translation in English by J Devika in Penguin titled The Hangwoman. I am particularly interested in knowing your views on the book as it is set in Kolkata besides dealing with an issue that will undoubtedly be of interest to you. Thanks, Pradeep, that’s very generous of you. I read Aarachar some months ago and probably won’t be able to review it for the column because the translation was published in 2014, not this year; but it was brilliant. If I can find the time, will try to blog about it once I’m done with edits on a book. That’s very kind of you! Did you have a chance to read the book?